The CM-512m3A spectrophotometer is a handheld, multi-angle device that works ideally with metallic colors. The device’s unique geometry offers an orientation error free symmetry that is often found lacking in other multi-angle devices. 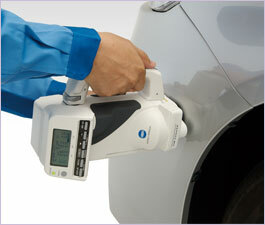 This device’s illumination provides impressively accurate results on both traditional and curved surfaces making formerly difficult samples such as door handles and vehicle mirror bodies easily measurable. The lack of moving parts means the handheld CM-512m3A Spectrophotometer is very hearty and rugged. Ring illumination – With illumination provided from 18 radial directions, the effect of workpiece orientation on measurement results can be eliminated. Line graph display – The graph display function enables easy color judgment even on production sites without using a personal computer. Evaluation equation suitable for measurements of metallic/pearl coating correlates well with visual evaluation with the CM-512m3A, the ΔE00 (CIE 2000) equation is used with parameters fine-tuned based on proprietary knowhow to provide measurement data for metallic/pearl coatings which correlate well with visual evaluation. 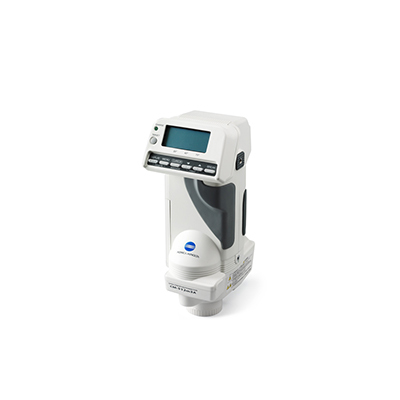 Average measurement – The CM-512m3A supports automatic average measurement and manual average measurement. In the former, precision is increased by taking multiple measurements of the same specimen location setting; in the latter, measurements of different specimen locations are performed to efficiently determine the overall average data. In addition, an outlier elimination function allows the two measurements with the greatest difference from the average to be removed before calculation is performed. Color-difference limit evaluation – Judgment as to whether or not a measured color is within a specific range can be made at a glance, thus simplifying quality-checking procedures. 440 data storage capacity – The CM-512m3A can store a total of 440 items of color-difference target data and measurement data.